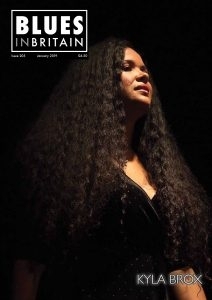 I’m on the front cover of Blues in Britain magazine (you can order your copy here…), with a great spread inside, including an interview, live gig review and the first review of the new album, Pain & Glory. It was a huge honour to be asked to join Paul Jones & Friends for his annual charity event, this year held at G Live in Guildford. I played with the house band, which was lead by the excellent keyboard player, Paddy Milner, with Dan on bass and included a full horn section. It was the perfect way to showcase a few of the songs from the new album, which features keys and horns through out. I spent a good hour chatting backstage with the charming, Rick Wakeman, whose solo performance on grand piano blew us all away. Also on the bill, one of my very favourites, Eric Bibb, the superstar that is Van Morrison and the lovely, Bernie Marsden, who had us all singing along to his massive Whitesnake hits. It was a dream come true to get up and sing with these legends at the big jam at end of the night, and quite surreal when Van Morrison gave me three times round my flute solo and with plenty of praise from him and the other starsafterwards! The icing on the cake is that we managed to raise over £30K for The Prostate Project and a further £10K for Cranleigh Arts Centre. What a night! down and dirty blues and my tribute to Koko Taylor. in Paris before we head to Memphis!